Click on the images for a larger image. A very comprehensive article by Simine Short on the 1904 glider has been published in the first issue of "The Flying Machine," a new (2016) quarterly journal which can be purchased at Aerodynamic Media's website as print or a PDF download. The article not only describes in detail the preparations and launch at the exposition, but also the eventual fate of the glider which was shipped to France. 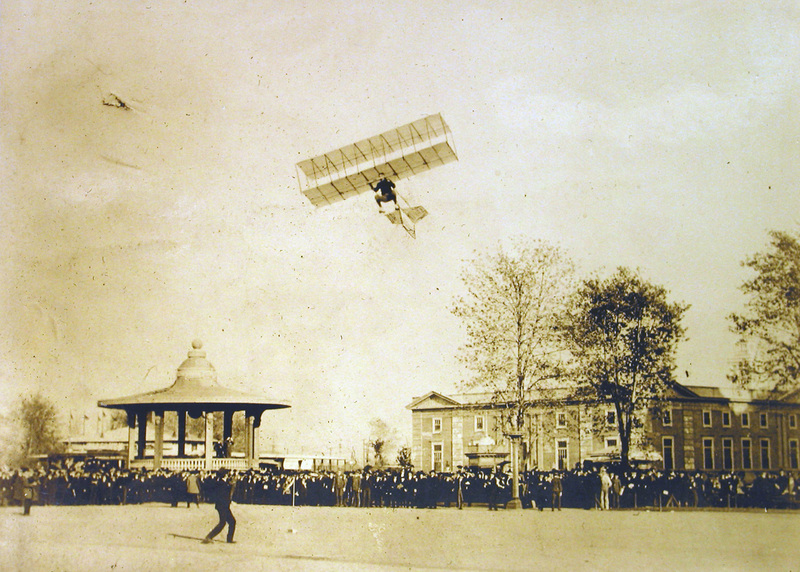 The aeronautics displays at the Exposition held in St. Louis in the fall of 1904 were largely organized by Octave Chanute. 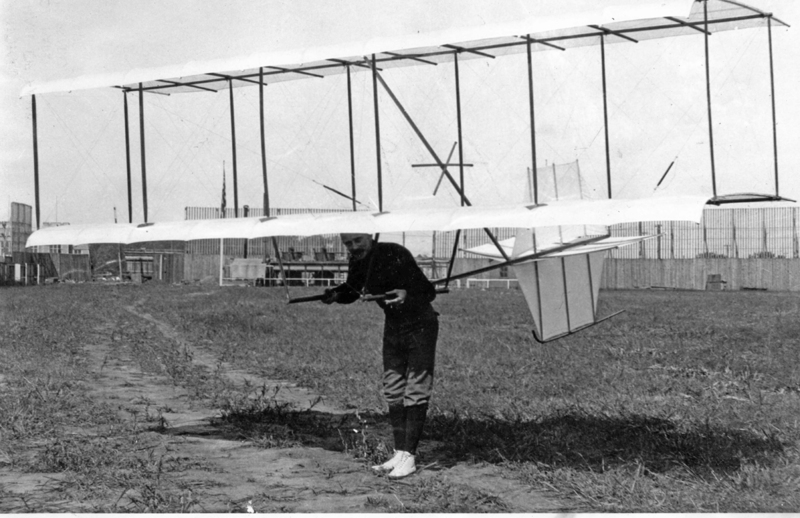 As no one else came forward to show any heavier-than-air craft, William Avery suggested they enter a biplane glider. 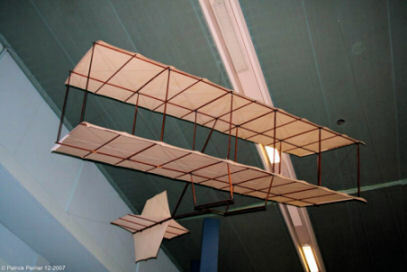 The new glider was based on the original design but employed changes that were developed by others in their aircraft, including the Wright brothers. The main change was a different wing profile. 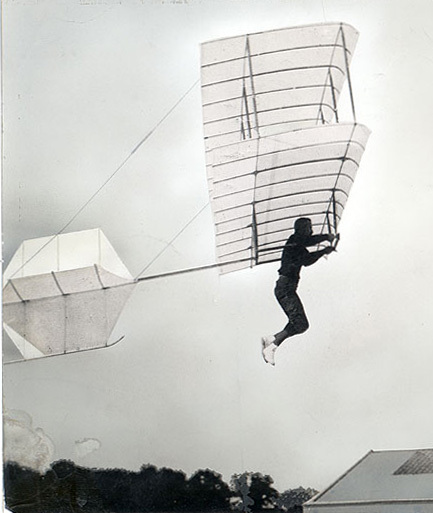 This photo shows William Avery having been launched into a glide. 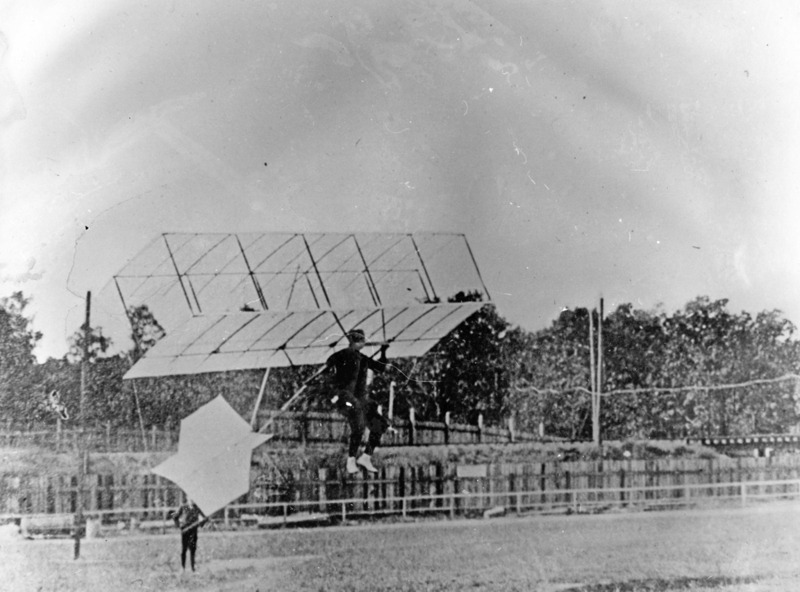 To launch the glider from a level field, Chanute devised a launching apparatus in which the pilot, holding the glider, stood on a small rolling dolly on a movable rail track. A towrope from the glider was attached to a large drum 400 feet away. A 10 horsepower electric motor rotated the drum at a rapid rate, pulling the glider forward and launching it like a kite. When the pilot was safely airborne, he released the tow rope. 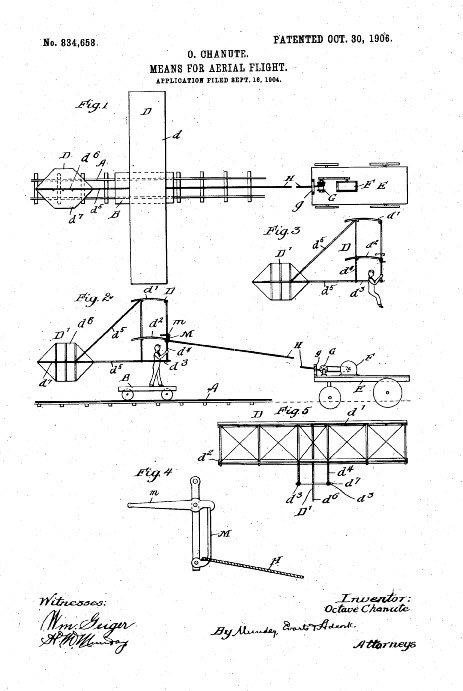 When Chanute had become satisfied that the launch apparatus would work he patented "Means For Aerial Flight,"
filing the patent Sept. 16, 1904, patented October 30th of that same year. Click on the image thumbnail for the patent drawing, or view the full patent here. Due to difficulties getting this electric winch going, Avery at first used man-power to get bungee launched on 23 September. First flown this way on October 6th, Avery had the winch ready and used it for the first time, ascendinged 70 feet and glided up to 300-350 feet. He made daily demonstrations until October 25th until an accident befell him. The towrope, which had been frayed being used in a kite-flying contest, broke, and Avery's fall so sprained his ankle that he had to withdraw from the glider competition. But the glider was barely damaged. As soon as Avery could walk withoiut crutches, he fixed the glider which was then shipped in February to Jacques Balsan in France. Here Avery poses with the glider. Avery launched into the air. Two of the above pictures were originally sent to me as scans from The Aero, issue of 22 February 1911 by Daniel Hartstein of Stockholm University. Mr. Hartstein also sent me an OCR scan of the letter that Avery wrote to The Aero. The pictures have been updated to better quality pictures from Simine Short. In the letter to The Aero that accompanied the pictures, Avery wrote that he had built the glider for Mr. Balsan, a Frenchman. It is most likely that he meant to say that M. Balsan bought the glider from Chanute, for it is evident from the Chanute papers that Chanute commissioned the glider. Avery's memory suffered on other accounts in this letter to The Aero. Besides referring to it as the 1903 Exposition rather than the 1904 Exposition in the photo captions, The Aero published another photo provided by Avery of the 1896 experiments referring to it as the 1892 experiments. And thanks to Daniel Hartstein of Stockholm, Sweden for The Aero letter and photo scans. Those two images were replaced by Simine Short for better images. She also provided two other images. Thanks to Simine!